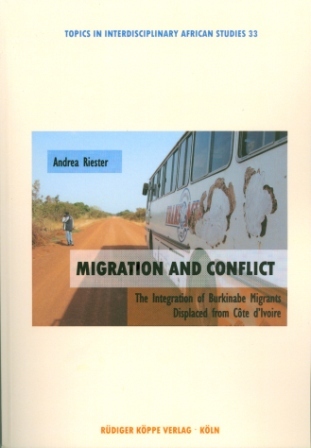 Migration and Conflict contributes to transnationalism research and ethnographic writing about Westafrica. It deals with questions of integration and collective identity in the context of migration by looking into the multi-ethnic and multi-religious locality of Batié in southwest Burkina Faso. The town experienced rapid social change brought about by the arrival of a large number of displaced migrants from Côte d’Ivoire during the civil war in 2002-3. The book analyses conflicts between these rapatriés and non-migrants as negotiations about identity and belonging. Andrea Riester studied Social Anthropology, Political Science and Economics at Freiburg im Breisgau and Glasgow. She received her PhD from the Martin-Luther-Universität Halle-Wittenberg (Germany). She works as migration expert for the Deutsche Gesellschaft für Internationale Zusammenarbeit (GIZ) GmbH.